Following in the footsteps of Gears of War and becoming an honorary member of the "If One Is Good" club, Resident Evil 5 will feature a co-op "campaign" so that two people can get in on the action at any time. The screens and video of RE5 so far look very similar to RE4. I have always felt that the team had possibly run out of ideas, and they were just making a prettier version of RE4 on the 360 and PS3. Now, the new features of RE5 are simply what every other shooter is doing or has done. Along with co-op, players can snap to cover and shoot around walls. Sound familiar? To be fair, the RE5 team is also adding a dodging system from a game they had previously released on the PS2 called God Hand. We'll have to wait and see how much these new mechanics changes the gameplay. In the long run, if RE5 comes out and it's basically RE4 times two, don't look so surprised. Do the math. 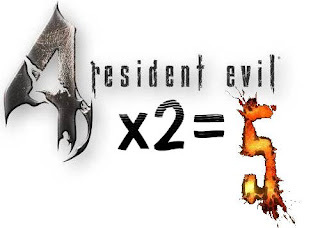 (Even if it is RE4 x2, it'll still be amazing). On a completely unrelated note, while playing WiiFit recently, I was reminded of a design element that I really appreciate. When navigating the menu's of WiiFit or WiiSports, you can either use the pointer or the D-pad to get around. Most of the Wii game's I've played strictly allow one or the other. Once again Nintendo has created an excellent example for other to follow, and nobody does. Failing to incorporate a feature like this is the most egregious in Super Smash Brothers Brawl. Sakurai did all the work designing big colorful distinctive buttons on all of his menus that are perfect for pointing, yet he failed to add pointing based menu controls. I can understand that he didn't want to use any of the Wiimote's unique controlling feature in Brawl fighting gameplay because of how untested and risky that would have been. But designing pointer controls for a menus isn't very hard or risky. And with a team of over 300 people working on the game, it's a shame no one bothered to. I find it amazing that game developers can blatantly copy other games and fail to copy features like the WiiSports/WiiFit menu navigation system. Though such a system is small and not as important as gameplay elements, including such a system shows a level of dedication and attention to detail that is reflective of the dedication throughout the rest of the game. In other words, it's not that Nintendo makes a great menu to make a great game. Rather, Nintendo designs and seeks to create the smoothest and most enjoyable experience for the player no matter which part of the game they're currently involved in.